Gold has rebounded in 2012 after a tough month of December. Leading the reversal are gold stock ETFs, gaining as much as 7% year to date, while physical gold ETFs have only gained around 4%. The best performing gold stock ETF is small cap in nature and also sports the largest dividend distribution. That ETF is from Market Vectors and is the junior gold miners ETF, GDXJ. It is outperforming the "worst" gold stock ETF year to date, Market Vectors large cap gold miner ETF (NYSEARCA:GDX) by a little over two percent. GDX's gain of 5.6% year to date is still over .60 bps ahead of the best performing physical gold ETF, iShares' IAU. The other two gold stock ETFs Global X's GGGG and GLDX, are performing well at 7.1% and 5.7% respectively. Here are two performance charts - the first chart lists all gold stock ETFs and the second lists all physical gold ETFs. Gold stock ETFs are off to a great start in 2012. As an added benefit versus physical gold ETFs, gold stock ETFs pay dividends. 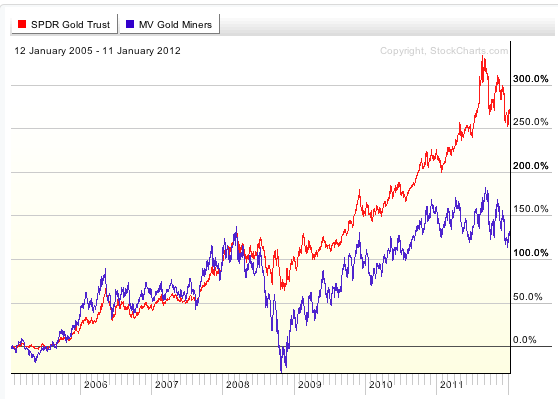 Physical gold ETFs are positive for the year and finished 2011 with a gain, unlike all gold stock ETFs. Gold stock ETFs had a horrible 2011, with every ETF in that category generating negative returns. Physical gold ETFs however gained around 10% in 2011. Stepping back it appears that gold stocks may be just trying to catch up to gold price performance. Indeed as we have pointed out before, gold stocks have been trading at a wide historical disconnect to physical gold prices. Here's the updated performance chart of GDX, the largest gold stock ETF and GLD, the largest physical gold ETF courtesy of stockcharts.com. Gold mining stocks have disconnected from gold prices by a wide historical margin. Going forward, gold stock ETFs may continue their strong performance versus gold should equity market conditions improve and attractive dividends are paid to shareholders. Physical gold ETFs however stand to benefit more in uncertain times and it appears more uncertainty lies ahead with the EU crisis continuing its spiral and tensions in Iran mounting. Additional disclosure: Christian Magoon is the publisher of GoldETFs.biz.